German commercial and fortified city in the province of Alsace-Lorraine. 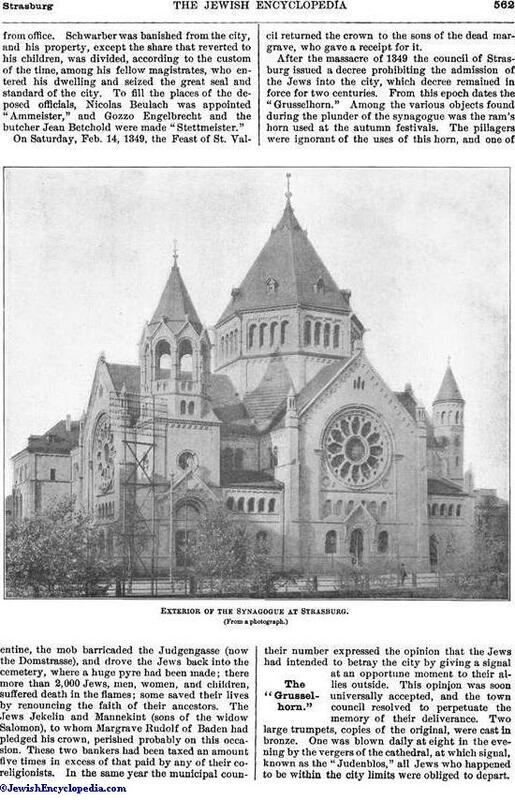 Legend relates that after the destruction of the Temple a number of fugitive Jews escaped to Europe, Some settling in the south of France, while others wandered north along the banks of the Rhine, finally establishing themselves in the town of Worms and throughout the province of Alsace, where they founded Strasburg. Authentic history of this city begins with the Schoepflin "Chronicles," in which Jews are recorded as living there in the days of Charlemagne under relatively favorable conditions. They enjoyed freedom in commercial matters, had their own judicial code, and possessed the right to own property, bear arms, and demand the protection of the authorities. This peaceful time ended with the inception of the Crusades. In 1095, when the First Crusade was preached by Peter the Hermit, 1,500 Jews were burned alive in Strasburg alone. Similar scenes of revolting cruelty attended the preaching of the Second Crusade, in 1146, when a monk named Rudolf of Strasburg declaimed against the Jews as the worst enemies of Christianity; but the emperor and some of the higher dignitaries of the Church protected them from at least the more violent outbreaks of popular fury. In 1160, the year of the visit of Benjamin of Tudela, Strasburg was one of those cities which possessed Jewish schools conducted by illustrious scholars. 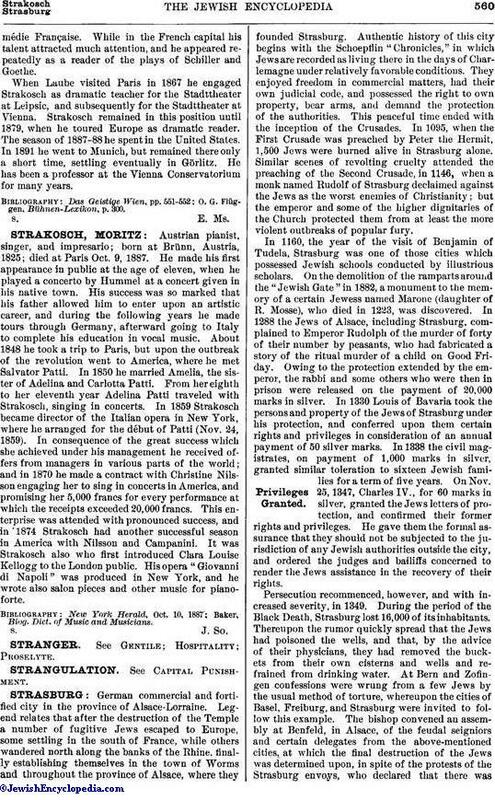 On the demolition of the ramparts around the "Jewish Gate" in 1882, a monument to the memory of a certain Jewess named Marone (daughter of R. Mosse), who died in 1223, was discovered. In 1288 the Jews of Alsace, including Strasburg, complained to Emperor Rudolph of the murder of forty of their number by peasants, who had fabricated a story of the ritual murder of a child on Good Friday. Owing to the protection extended by the emperor, the rabbi and some others who were then in prison were released on the payment of 20,000 marks in silver. In 1330 Louis of Bavaria took the persons and property of the Jews of Strasburg under his protection, and conferred upon them certain rights and privileges in consideration of an annual payment of 5O silver marks. In 1338 the civil magistrates, on payment of 1,000 marks in silver, granted similar toleration to sixteen Jewish families for a term of five years. On Nov. 25, 1347, Charles IV., for 60 marks in silver, granted the Jews letters of protection, and confirmed their former rights and privileges. He gave them the formal assurance that they should not be subjected to the jurisdiction of any Jewish authorities outside the city, and ordered the judges and bailiffs concerned to render the Jews assistance in the recovery of their rights. Persecution recommenced, however, and with increased severity, in 1349. During the period of the Black Death, Strasburg lost 16,000 of its inhabitants. Thereupon the rumor quickly spread that the Jews had poisoned the wells, and that, by the advice of their physicians, they had removed the buckets from their own cisterns and wells and refrained from drinking water. At Bern and Zofingen confessions were wrung from a few Jews by the usual method of torture, whereupon the cities of Basel, Freiburg, and Strasburg were invited to follow this example. The bishop convened an assembly at Benfeld, in Alsace, of the feudal seigniors and certain delegates from the above-mentioned cities, at which the final destruction of the Jews was determined upon, in spite of the protests of the Strasburg envoys, who declared that there wasnothing whatever to be said against the Jewish population of their city; that the Jews had received their privileges from the emperor himself, and from the bishop and magistrates, and had paid well for them; that, furthermore, the city owed the Jews large sums, payment of which had been guaranteed on a fixed date; that the city government had also granted the Jews sealed letters of protection and had published an edict against all who should venture to commit excesses against them, imposing heavier penalties than were usual in the case of Christians; and that the magistrates, therefore, were only acting within their rightful authority and according to their duty in making a vigorous opposition to any species of persecution. Plan of Strasburg. Star Shows the Gate Leading to the Jewry. (From an early seventeenth-century print. But the populace, enraged by the excessive fluctuations in the prices of grain, and urged on by those who knew their own power, would not be guided by the calmer reasoning of their rulers. For a brief space, it is true, their anger was appeased by the representations of the authorities, but it broke forth anew at the instigation of the butchers' gild. The "Ammeister" Peter Schwarber, and the two "Stettmeister" Goffe Sturm and Conrad Kuntz, were accused of having been bribed to oppose the Jews' extermination, and were removedfrom office. Schwarber was banished from the city, and his property, except the share that reverted to his children, was divided, according to the custom of the time, among his fellow magistrates, who entered his dwelling and seized the great seal and standard of the city. To fill the places of the deposed officials, Nicolas Beulach was appointed "Ammeister," and Gozzo Engelbrecht and the butcher Jean Betchold were made "Stettmeister." On Saturday, Feb. 14, 1349, the Feast of St. Valentine, the mob barricaded the Judgengasse (now the Domstrasse), and drove the Jews back into the cemetery, where a huge pyre had been made; there more than 2,000 Jews, men, women, and children, suffered death in the flames; some saved their lives by renouncing the faith of their ancestors. The Jews Jekelin and Mannekint (sons of the widow Salomon), to whom Margrave Rudolf of Baden had pledged his crown, perished probably on this occasion. These two bankers had been taxed an amount five times in excess of that paid by any of their coreligionists. In the same year the municipal council returned the crown to the sons of the dead margrave, who gave a receipt for it. Exterior of the Synagogue at Strasburg. 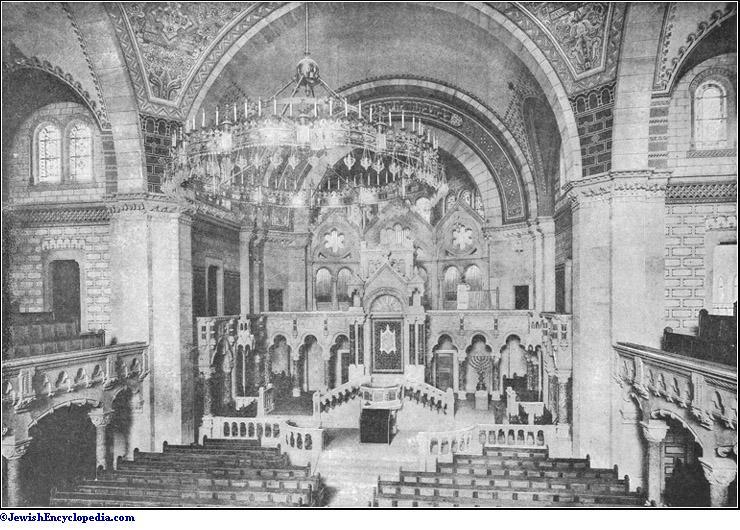 Interior of the Synagogue at Strasburg. After the massacre of 1349 the council of Strasburg issued a decree prohibiting the admission of the Jews into the city, which decree remained in force for two centuries. From this epoch dates the "Grusselhorn." Among the various objects found during the plunder of the synagogue was the ram's horn used at the autumn festivals. The pillagers were ignorant of the uses of this horn, and one of their number expressed the opinion that the Jews had intended to betray the city by giving a signal at an opportune moment to their allies outside. This opinion was soon universally accepted, and the town council resolved to perpetuate the memory of their deliverance. Two large trumpets, copies of the original, were cast in bronze. One was blown daily at eight in the evening by the vergers of the cathedral, at which signal, known as the "Judenblos," all Jews who happened to be within the city limits were obliged to depart. The second was blown at midnight to recall to the inhabitants the alleged traitorous plot of 1349. The rigid enforcement of the decree forbidding any Jew to reside in Strasburg was soon relaxed, and in 1368 six families were permitted to return for a term of five years, under certain conditions. This term was later extended to 1375. Nine other families obtained a similar license in 1369, on condition of an annual payment to the town council and the bishop. On Dec. 7, 1384, a Jewish physician, Dr. Gutleben, obtained leave from the council to reside in the city for six years without the payment of any protection money, in order that he might bestow the benefit of his medical knowledge upon the populace. He was even to receive a fixed stipend of 300 florins per annum for his services during this period, and was authorized to lend at interest money belonging to himself, although he did not enjoy this liberty with funds belonging to others. Somewhat later, in 1388, the Jews of Strasburg ceased to pay their taxes regularly; and, having adopted a somewhat critical and censorious attitude in regard to a dispute between the city and the Duke of Burgundy, they were sentenced to perpetual banishment and to the payment of a fine of 20,000 florins. This second decree of banishment was so strictly enforced, and the time allowed for preparation so inadequate, that the Jews had to abandon their books as well as the scrolls of the Law and other articles used in religious services. The copies of the Talmud and the scrolls of the Law were preserved in the library of the city, and were destroyed, with many other literary treasures, in the bombardment of 1870. Little mention of the Jews occurs in the monastic chronicles throughout the entire fifteenth century. In 1520 they were allowed to enter the city only during the usual hours for strangers, on condition of wearing a yellow badge or shield in some conspicuous place on their garments. In 1534 Rabbi Joselmann of Rosheim wrote a letter of thanks to the council for certain privileges granted to his fellow worshipers. A decree, issued in 1539 and renewed in 1570, 1628, and 1661, forbade Christians to enter into any contracts with Jews, save such as related to the purchase of horses or of food-supplies. In 1657 Louis XIV. took the Jews of Alsace under his royal protection, greatly to the dissatisfaction of the smaller communes, which, faithful to old traditions, considered them as interlopers and dangerous parasites. But after the capitulation of 1681 the city of Strasburg succeeded in maintaining in force the old statutes against the Jews. Nevertheless, qualified permits of entry and residence within the city continued to be issued to the Jews. In 1743 the council relaxed its extreme severity and granted a number of privileges to various Jews, especially to a certain Moses Bliem. Count d'Argenson of Versailles wrote personally to the municipal authorities, stating that the Moses Bliem in question, together with his coreligionists and business associates Jacob Baruch Weill, Aaron Meyer Lehmann, and Lieb Netter, had for two years past been furnishing supplies to the royal armies of Germany, and that they required permission to open an office in Strasburg for their correspondence. The permission was granted, but not for any definite length of time; it was understood that it was to last only as long as the army remained in Germany. A single Jew, of all the dwellers on the Upper and Lower Rhine, won the unanimous respect of the authorities on both sides, owing to his great wealth and still more to his charities during the scarcity of food-supplies in 1770 and 1771; this was Herz Cerfbeer, of Bischofsheim, near Strasburg. 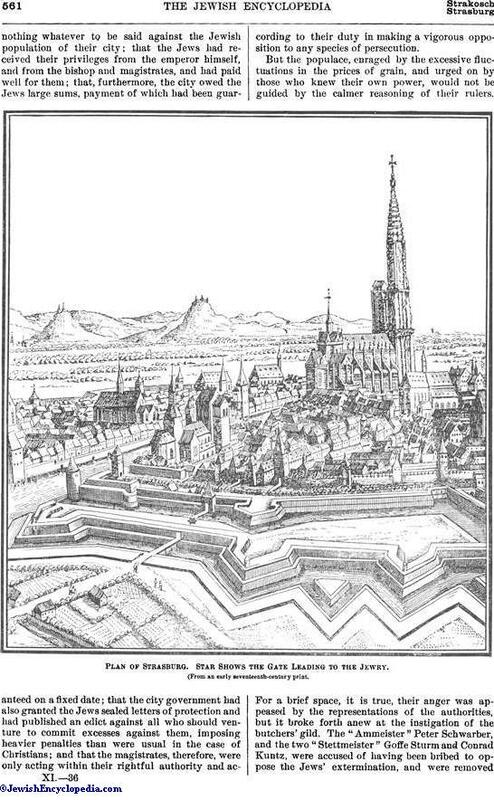 On Aug. 5, 1767, Cerfbeer, whose real name was Herz Medelsheim, proposed to the Jewish communities of Alsace to contract for the furnishing of supplies to the armies of Louis XV., and for this purpose requested permission from the Strasburg authorities to spend the winter in that city in order to escape the robberies so frequent on the outskirts. At first his petition was rejected; but Cerfbeer applied to the Duke of Choiseul at Paris, and an order dated Versailles, Jan. 22, 1768, was sent to the council and magistracy of Strasburg, directing them to accede to this request. Thus Cerfbeer was the first Jew who had a definite residence in the city after this long period. He was at first obliged to submit to certain restrictions, such as those against opening a synagogue or receiving any foreign Jew into his house. 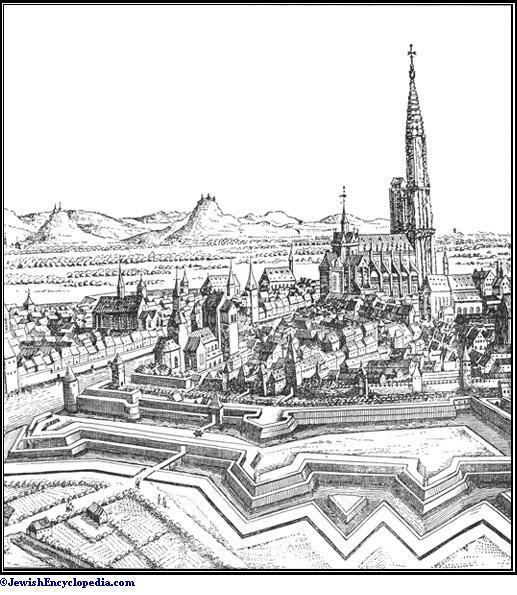 He soon obtained permission to live in the city during the summer as well; and in a document dated Nov. 5, 1771, the Marquis of Monteynard declared to the royal procurator that the presence of Cerfbeer was necessary for the welfare of the city, and that it was the King's will that Cerfbeer should reside in the town throughout the year. In March, 1775, by letters patent given at Versailles, the king granted naturalization to Cerfbeer and his children in return for the many important services rendered by him to the army and as a testimony to his zeal for the good of the state. Cerfbeer thus was the first Jewish citizen of Strasburg: the household he brought with him comprised sixty persons. A royal decree dated Jan., 1784, abolished the poll-tax levied first upon Moses Bliem and later upon Cerfbeer. In 1781 a deputation from Alsace-Lorraine was sent to present the Jewish grievances at the bar of the National Assembly at Paris, and the subject was debated at several sittings. Rewbel, Maury, and the Duc de Broglie, deputies from Alsace, contended that the Jews were all addicted to usury and had turned Alsace into a Jewish colony. To this Mirabeau, the Abbé Grégoire, and even Robespierre replied that the vices of the Jews were the result of the degradation into which they had been thrust; and that they would behave well as soon as they found any advantage in doing so. 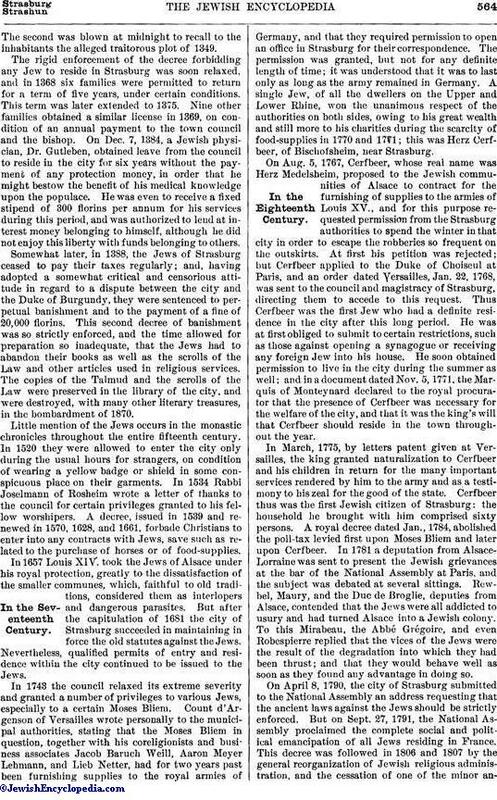 On April 8, 1790, the city of Strasburg submitted to the National Assembly an address requesting that the ancient laws against the Jews should be strictly enforced. But on Sept. 27, 1791, the National Assembly proclaimed the complete social and political emancipation of all Jews residing in France. This decree was followed in 1806 and 1807 by the general reorganization of Jewish religious administration, and the cessation of one of the minor annoyancesto which the Jews had been subjected—the blowing of the "Grusselhorn." In 1809 the community of Strasburg opened its first synagogue in the ancient Poële des Drapiers. In 1836 the erection of a new synagogue was begun on the Rue Ste. Hélène; it was in existence until 1898, when it was replaced by a larger one on the Quai Kleber, in the heart of the city. 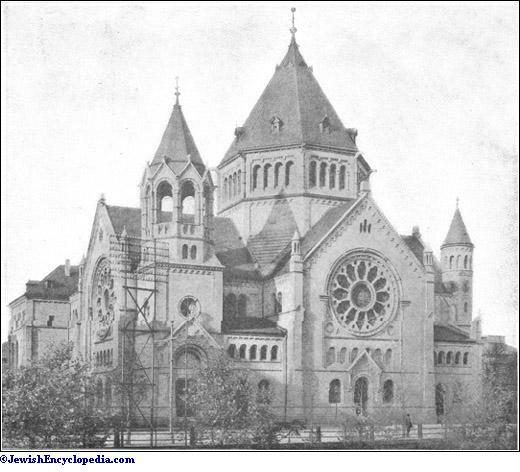 The new synagogue was opened Sept. 8, 1898. 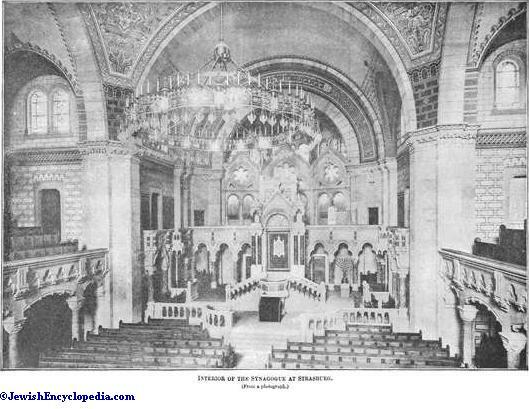 There is also a congregation, 'Eẓ Ḥayyim, composed of about forty families, which separated from the main body owing to a difference regarding the question of an organ in the synagogue, but which maintains friendly relations with the larger community. The first chief rabbi of Strasburg was David Sinzheim, president of the Sanhedrin of 1807 (d. Paris, Feb. 12, 1812, while chief rabbi of France). He was succeeded by Arnold Aron, who filled the office for more than half a century, and died April 4, 1888. Isaac Weill, chief rabbi of Metz, succeeded him, and died in June, 1899, at the age of fifty-eight. Chief Rabbi Adolphe Ury of Metz was appointed in his stead by an imperial decree dated Jan. 23, 1900, and was formally installed in office Feb. 18, 1900. He is the present head of the Strasburg community, as well as of all communities of Lower Alsace. In addition to numerous societies for the aid of the sick and the poor, a large hospital was erected in 1887, on the Hagenau Platz, near the Steinthor. There is also an orphanage for young girls, which entered its own quarters March 26, 1903. In 1853 Louis Ratisbonne, president of the consistory, founded at his own expense an almshouse, the Eliza Hospiz, in memory of one of his cousins. The foundation in 1825 of a Jewish school of arts and trades, the Ecole de Travail, was also due to Ratisbonne. 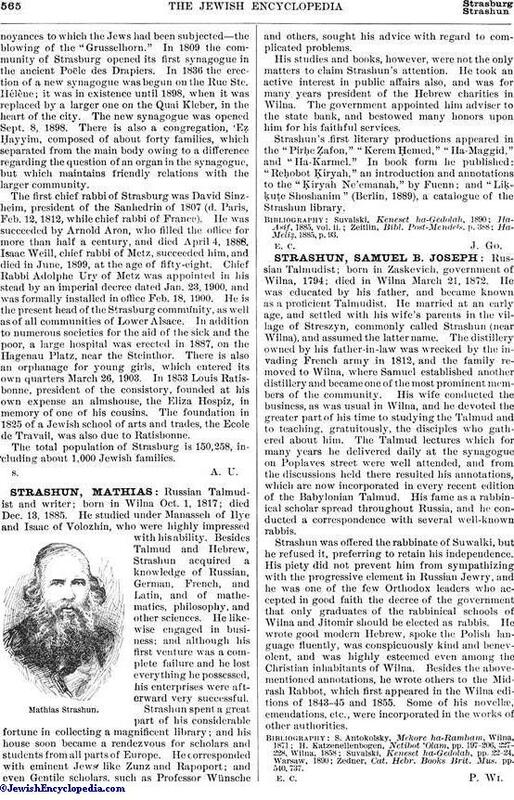 The total population of Strasburg is 150,258, including about 1,000 Jewish families.